C & J Fencing is a well-established fencing and decking company based in the San Francisco Bay area. As a highly accredited company, neither their website or print matierals coincided with the quality and design of their work. 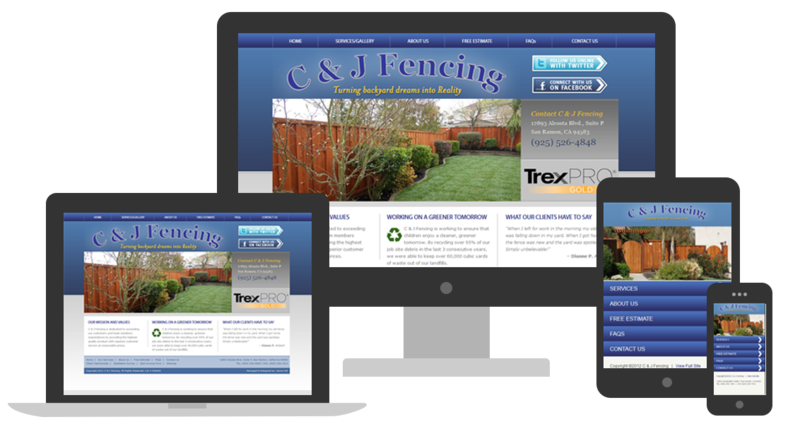 I was tasked with a complete redesign & rebuild of C & J Fencing's website as well as a few print marketing peices to help promote their products and services. I designed and developed a cohesive website that fit with C & J Fencing's current branding style, while portraying their work in an elegant setting. Rotating banner images, product specific photo galleries, and easily accessible contact forms makes for a user experience that directly matches the detailed level of service C & J Fencing provides their customers. Jaime did a great job of completely the project in a time frame that was not easy, she did a complete redesign with a Salesforce integration in less than two weeks. Given the budget that we had to work with, she more than exceeded my requests and vision. I will be using Jaime again as we hope to continue growing our site. Thanks for all the help. We couldn't have done it without you!